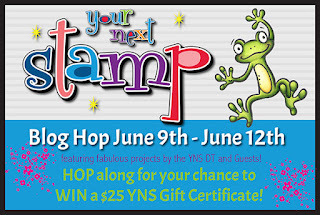 The DT for Your Next Stamp is showcasing their favorite in a blog hop this month instead of hopping along with a new release. But don't worry! We will be back next month with a new release! This was a hard task to do as there are so many fun and favorite stamp sets with YNS. But I am always partial to sentiments. So, I decided to make this card with one of my favorite sentiment sets, Whatnot Sentiment Eleven and a die set, Rainbow Fun, that I love as well but just haven't used often. I thought they were perfect together. I used the Stitched Scallop rectangle dies for the background and cut out the rainbow with different colored card stock. I then put them together before adding some embossing powder to it to give it its glitz! The clouds were added and I used different colored Memento inks for the sentiment colors. The card was finished using different colored gumdrops. Just a happy card with happy colors! For this special hop, Karen has a fabulous sale to share with you all. 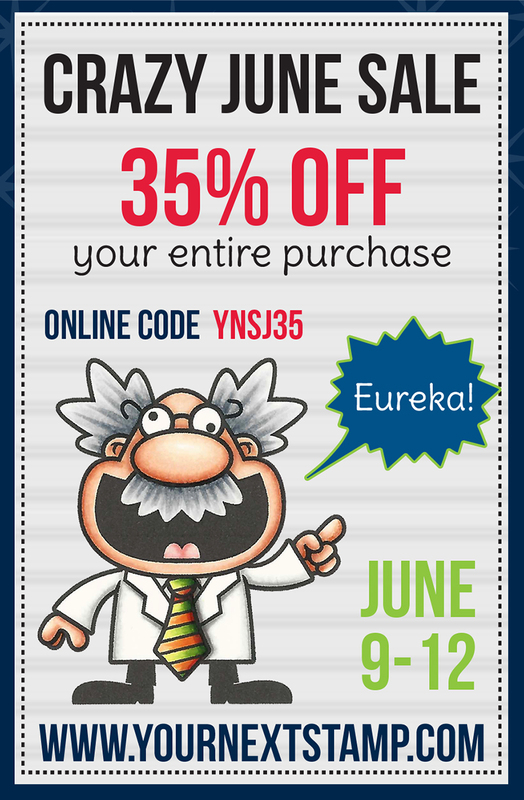 It's the crazy June sale!! Make sure you hop on this sale so you don't miss out on YOUR favorites!! Thanks for hopping by! I love the glitter rainbow. What could be better? Oh yea glitter gum drops. Thanks for the inspiration. Love your adorable glittery rainbow! How fun! Lovely glitter rainbow. Sweet cheery card! LOL! Perfect card for all of your crafty friends! I LOVE it! So bright and cheerful! I LOVE THIS! Rainbows are my favorite! So bright and cheery! Love this card. Great design. Love love love this sentiment sooooooo fun! Such a cheerful card. I love it so much. Thanks for sharing with us Deborah. Love the matching rainbow sentiment! So cheery and adorable! 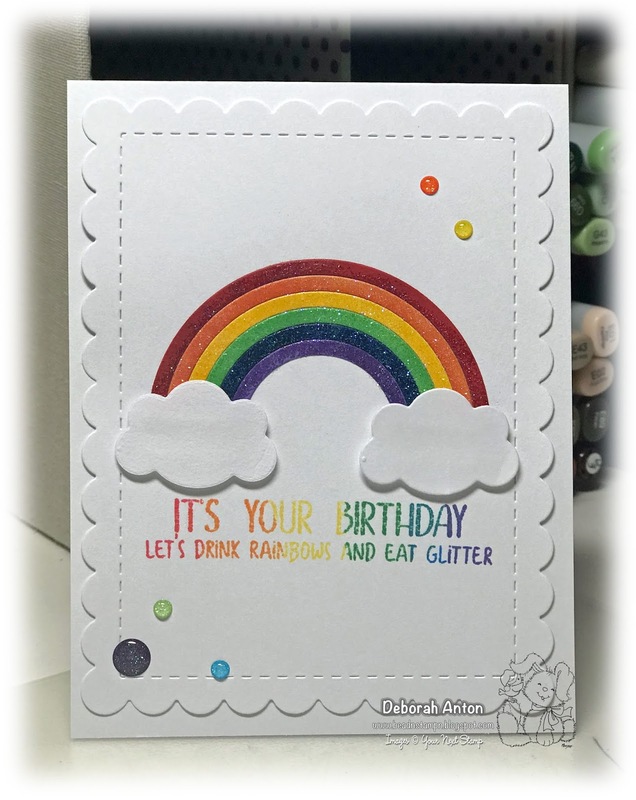 Great rainbow card - I LOVE how you did your sentiment! What a fun sentiment and cute design! Love the rainbow of colors and the sparkle. Super fun card! Love how you used the inks to create the rainbow sentiment. Such a cheerful card! Fun colors. I love that you matched the sentiment to the rainbow! Really fun card. Great rainbow dye cut and I love how you mimic the rainbow in the sentiment too! great sentiment and love the sparkle! What an adorable card design !! I love your cheerful rainbow so much !! A rainbow is always a fantastic idea for a card, so two rainbows are even better !